Just an idea, could crash and burn but we’ll see. 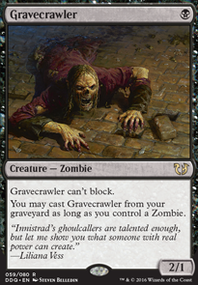 The idea is to get out a couple of small creatures like Bloodghast and Gravecrawler that can be returned from your graveyard easily to use on the sacrifice trigger from Lord of Tresserhorn, then buff him up and swing in for the win in one or two turns. Notion Thief can steal the draw given to your opponents. The deck also runs ways to counter the triggered ability of him entering the battlefield like Stifle and Torpor Orb among others. After Lord of Tresserhorn is on the field, Anger can give him haste, as well as Lightning Greaves and Swiftfoot Boots. Other win cons include Tainted Strike, Distortion Strike and Uncaged Fury. In addition to making Lord a hard hitter, the deck also runs cards like Key to the City and Whispersilk Cloak to make him unblockable, and Loxodon Warhammer for obvious reasons. Happy hunting!